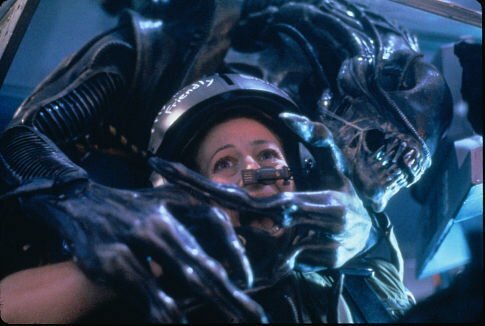 Since I had already seen Alien, I decided to also watch Aliens before seeing Prometheus. Thing is, once you see Alien, you think you know what to expect. This time the title suggests there will be more than one alien, out to kill and use the poor humans as part of their nightmarish reproductive process. But there is so much more than that, and the new surprises will keep anyone on the edge of their seat and some may even scream in pure terror. Our hero from Alien, Ripley (Sigourney Weaver), has been drifting through space for a surprisingly long time, and is found. She explains her journey and all that happened to her crew, but no one seems to believe her story, or want to. Worse, the planet her crew had encountered the alien on is now being colonized. 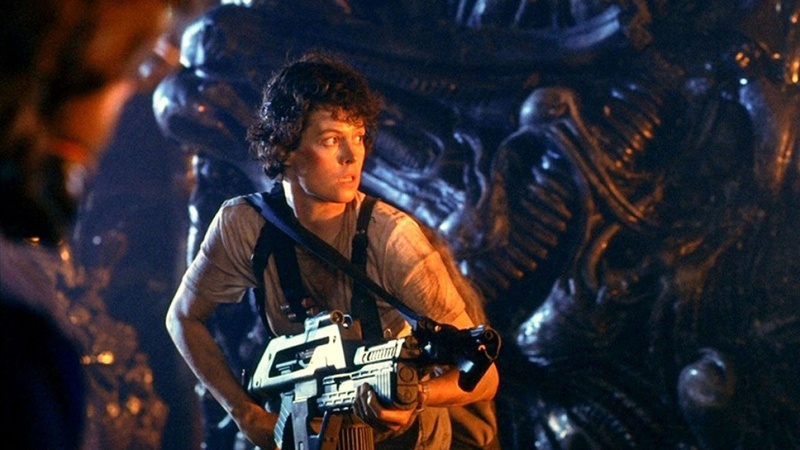 When all contact with the colonists is suddenly lost, Ripley is reluctantly recruited with a band of rough and tough space marines to investigate, and if necessary, wipe out the aliens. When the crew lands and begins to investigate, I felt like I was just holding my breath, waiting for the alien attacks to begin. Director James Cameron does a great job of continuing the story and pulling all the tension for a long enough time that we get very anxious and nervous. The anticipation is worth the wait. When the chord finally snaps, the bang is bigger than we could have imagined and more continuous. There are so many aliens, all over the place! And the terrifying surprises just keep coming, over and over again until the movie ends. It’s such a great time! An interesting new character in this sequel is Newt (Carrie Henn). She is a girl, maybe eight years old, who has somehow survived while the aliens have killed all the other colonists. I’ve heard a few complaints about her, she doesn’t deliver the best lines, but I can forgive her. As the story moves, her knowledge of the ducts and tunnel systems is extremely valuable. And her screams add the perfect layer of chaotic noise to all the horror happening around her. Really, who wouldn’t be screaming like a little girl in that situation? Plus, Newt does help show Ripley as a slightly softer character in this film. The rest of the space marines are extremely tough, including the women. I love how they wake up from their prolonged sleep and start doing pull-ups and trash talking. Ripley can seem like Miss America next to Vasquez (Jenette Goldstein). And the fact that Ripley creates a strong bond with Newt, brings out a mothering side to Ripley as she tries to protect her. 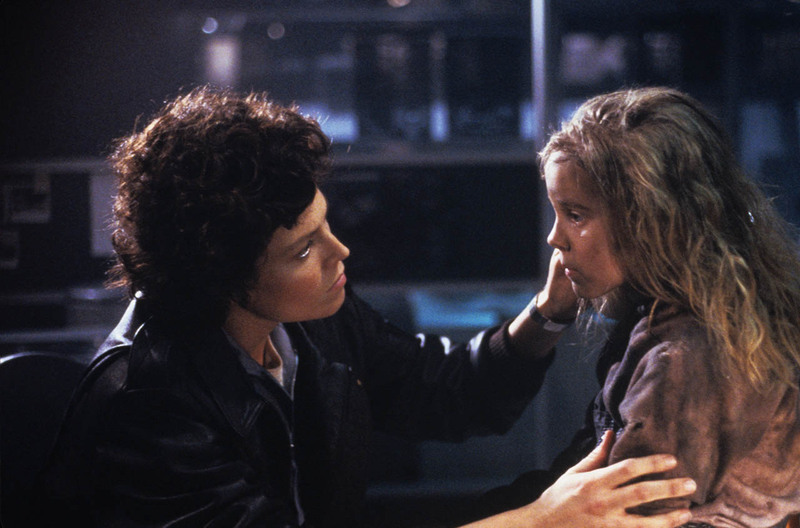 I would suggest seeing Alien before Aliens, not that the background information is critical, but the build up from one to the next is perfect. It’s like the chronicles of Ripley’s worst nightmare going from bad to horrifically worse. Things get darker and scarier quickly. The guns are bigger and so are the stakes. Of course, with more aliens come more problems.